Animals, both wild and domesticated, have been used in travelling or permanent circuses for many centuries, perhaps as far back as the gladiatorial spectacles of ancient Rome. Today, performances range from the familiar -- horses and dogs performing tricks and jumps -- to the more unusual, such as elephants walking a tightrope and big cats jumping through burning hoops. People have questioned the ethics of using animals in this way for many years. More recently there has been a growing awareness of health and welfare concerns surrounding wild animals in circuses. Some European countries -- but not yet the UK -- have banned the use of wild animals in circuses. There are a number of things to think about before visiting a circus. Choose your show carefully or you may be inadvertently supporting harmful or even dangerous practices. Many circuses require animals to perform and behave in ways that are deeply unnatural, and often physically and mentally harmful. If wild animals are performing unnatural acts, it can mean they have been subjected to abusive and violent training. Although domesticated animals are more used to human contact than wild animals, they can still suffer from harmful training methods and unsuitable, often unregulated, living conditions. When not performing, animals are often kept out of sight in restricted cages or enclosures with poor diets and inadequate care. The impact of frequent travel, disruption caused by being loaded and unloaded on and off trucks, and living in temporary enclosures, can all contribute to high levels of stress and even to premature death. When animals in circuses get too old and are no longer profitable for their owners, they may be sold or retired to even worse conditions, or simply killed. Wild animals are unpredictable and dangerous to their handlers and the public. Close contact poses a risk of injury or death, and the transmission of diseases. The practice of animals performing in circuses is well-established and might be seen by some people as normal and acceptable. Only recently have animal welfare concerns been recognised, leading some countries to introduce more stringent rules and, in certain cases, ban or phase out the use of wild animals in circuses. In general, animal welfare should never be compromised in the name of public entertainment. If you’re thinking of going to a circus that uses animals, the safest option is not to. However, if you are still determined to go, the following information will help you make an animal-friendly choice. Domesticated animals have been selectively bred over many generations for characteristics and traits to make them more able to tolerate life alongside humans. Wild animals retain all their original natural instincts, and never fully adapt to human contact and control. This means they can suffer serious psychological stress when kept captive and trained to perform circus tricks. This also applies to wild animals that are born in captivity and have never experienced their natural habitat. Even if an animal appears “tame” and compliant, its natural instincts and needs remain intact, as if it were living in the wild. Although domesticated animals may be more used to human contact, it doesn’t necessarily mean that their training and living conditions are appropriate and can satisfy their physical, social and psychological needs. 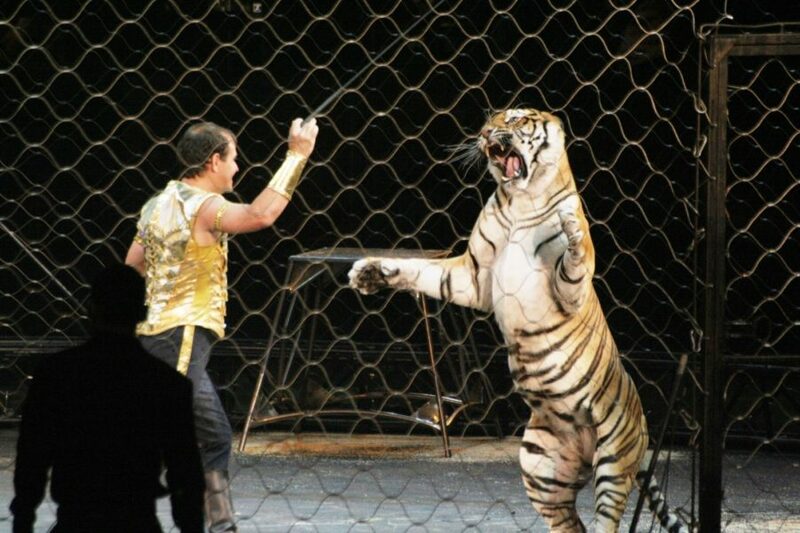 Many of the acts required of performing animals are completely unnatural, and even harmful. “Tricks” such as elephants standing on their heads or back legs, tigers jumping through hoops of fire and chimpanzees smoking cigarettes, all pose obvious risks to the individual animal. Some bizarre and unnatural acts, like elephants painting or riding on bicycles, which are meant to be funny and entertaining, are likely to require abusive and painful training. Abuse can include food deprivation, the use of physical force or emotional manipulation. Forcing a wild animal to accept close human contact often means separating it from its mother’s care at an early age. All this can cause serious long-term harm to the animal. Unnatural physical and social living environments, lack of privacy, extremes of noise and light, and frequent close proximity with people, can all cause damaging levels of discomfort and stress for wild and domesticated animals alike. Animals kept in captivity often become bored and frustrated with their restricted and barren surroundings. This lack of stimulation may cause them to develop strange, repetitive behaviours to try to cope with their stress. Big cats may constantly pace around their cages, and elephants frequently sway side-to-side. Both are examples of wild animals trying to cope with an unnatural, unrelenting and stressful environment. Stress, harsh training, lack of suitable exercise, low levels of social interaction and mental stimulation, and a poor diet can cause animals in circuses to become unwell. Should this occur, few circuses have suitably trained veterinarians on staff and most practising vets do not have appropriate training to treat exotic and dangerous animals such as big cats and elephants. Once they have been trained to perform, wild animals can almost never be released into their natural habitats. As they become older, less mobile, more prone to ill-health and less useful to their owners, they may be retired to low-grade permanent facilities, sold on to zoos, or simply killed.